I wonder how many races are sponsored by breweries? 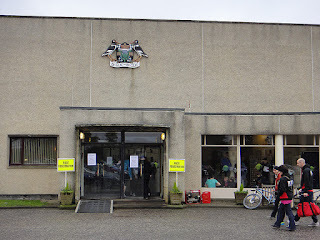 The DeVilla Forest 15km is a new race organised by the Carnegie Harriers, from Dunfermline. It almost fitted in with my marathon training programme, so I signed up. The race was extremely well organised. 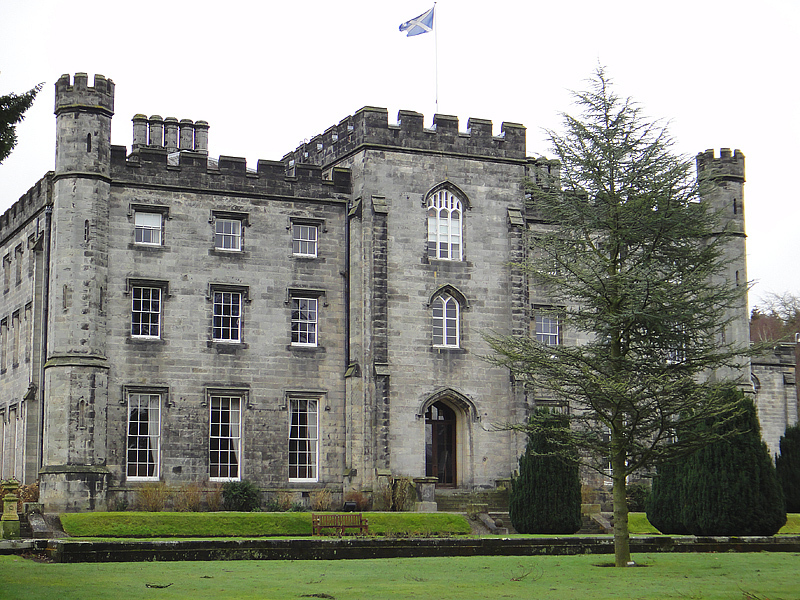 Start and finish were in the Scottish Police College at Tulliallan, near the village of Kincardine in Fife. 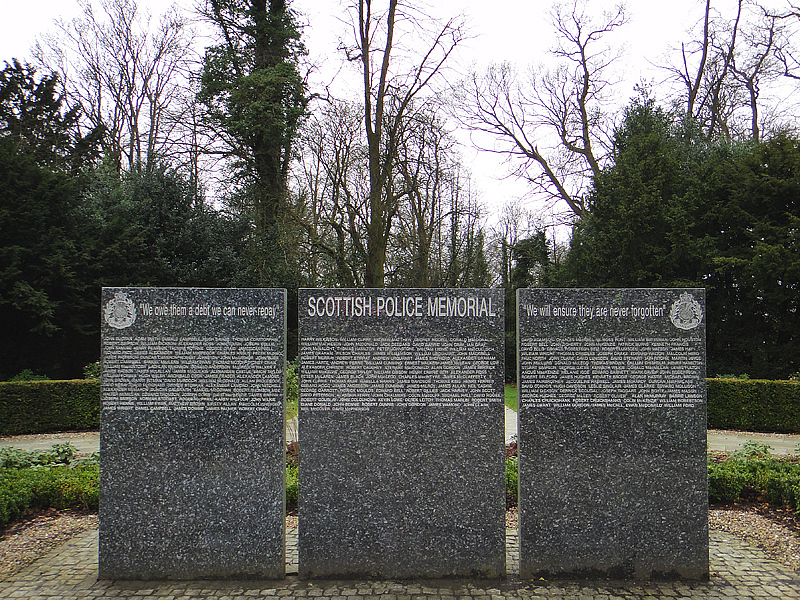 This is intended to be the home of a new Scottish National Police force, if the current plans come to fruition. The registration hall even had a Starbucks inside! The race started at 1100; I arrived rather earlier than I had intended at around 0930. I went into the recreation building to register, where I was quickly given my race number. 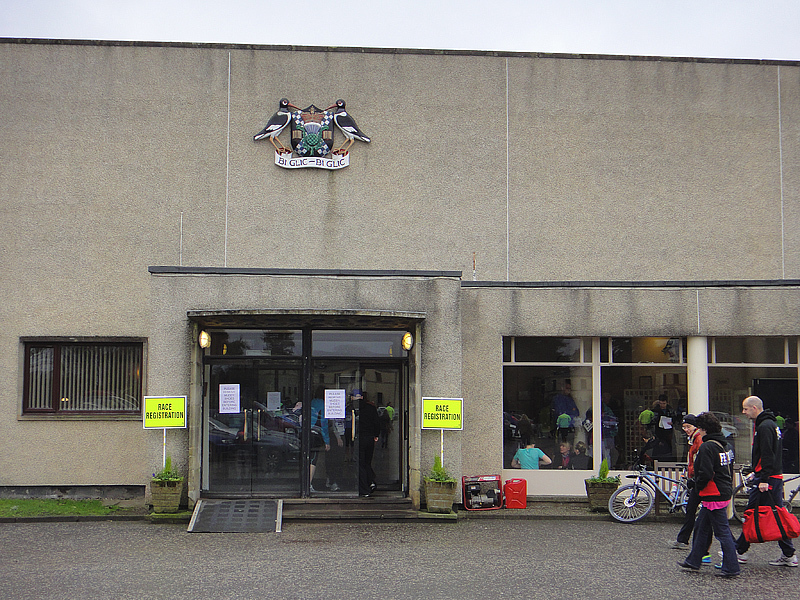 Across the hall I picked up my chip, then along a few steps to get goodies from the sponsors – a £5 gift voucher from Sweatshop and a bottle of Schiehallion Lager from the local Harviestoun Brewery! Now, I must confess that my preferred long drink comes from apples rather than hops, but I certainly plan to savour this bottle this evening! As I was early, I went for a bit of a wander. 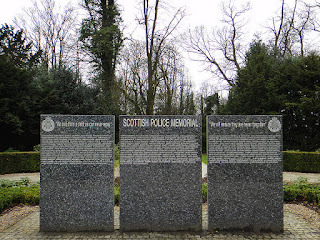 I walked to the start, which was between Tulliallan Castle and the Police Memorial monument, commemorating those officers who have dies in the line of duty. Then it was time to start. I was rather chilly, so wore 3/4 tights, a long-sleeved compression top with a vest over it (mainly to give me somewhere to pin my number). By the time I got into the race, I think that maybe short sleeves – and possibly shorts – would have been better. On to the race. We started in front of the castle, and ran along a paved road for a short distance to the forest. I made my first mistake at the start by allowing myself to be much further forward in the line than I should have been. To anyone I held up – sorry! Soon we were out on the forest roads – slightly muddy roads used by the vehicles that service the forest. And then, all of a sudden, we were directed off those roads and onto rabbit tracks, and then simply following arrows between the trees. Since by this time a good couple of hundred runners had already gone through these tracks, and it rained last night, it did become pretty muddy and slippery. It’s not all bad – it was really gentle on the knees. The “flatt-ish” course turned out to have a few more hills than I, at least, had expected. I think that my hill training is paying off a bit, as it was on these hills that I was able to catch up a little with other runners. However, I was definitely overtaken by many more people than I overtook. The water station was around four miles (I messed up with my Garmin, so not sure exactly where), and it was very much appreciated. Then we carried on round the Peppermill Dam, where was had a remarkably exciting and rapid downhill stretch through the trees, followed by a very… original… bridge across the dam’s spillway. During this stretch I fell once, which only marginally made me any muckier than I was already! We came back to the water station (it’s roughly a figure-of-eight course) and from there it was mostly downhill. Near the end there was a single-track stretch. There was a lady running behind me, but clearly catching up, so I gallantly let her go first. When it opened out, I caught up with her. 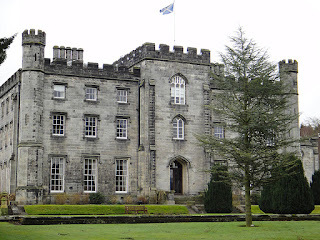 Eventually we saw that we were approaching the gate to go back into the grounds of the college. “No more chivalry, it’s a race from here on,” I laughed to her as we entered the college. She left me hopelessly in the dust… I reckon she must have gained fifty metres on me in that last three hundred! I messed up with my Garmin, and it had no satellite lock for the first six or seven minutes. I think in fact I stopped the timer when I was trying to lock the bezel. Even if I hadn’t messed that up, it is hopelessly inaccurate amongst the trees. So any thought of “pacing” went out the window. But this was a great race – congratulations to the organisers! My Garmin time (I tihnk the time is good even though part of the route is missing) is 1:16. You can see what I did get of the route on Endomondo. Week three complete and all going to schedule. Actually – whisper this – there are times it’s becoming just a bit boring. What I find helps a lot in this circumstance is audiobooks. Sure, listening to music can make me run faster, but listening to someone read you a story can really help get you out there. Right now I’m listening to “Faceless Killers” by Henning Mankell. The fact that I want to know whether Inspector Wallander gets his man (I’m sure he will) makes the whole idea of going out for a run all the more palatable. On the other hand, it makes actually getting out there a more involved process. I need to get the heart rate monitor strap appropriately clipped in place, the Garmin on the wrist, the phone in the pouch on the belt if I’m doing intervals (I need to learn how to use the Garmin for that), the iPod clipped onto the belt, the headphone cable routed through my clothes and the headphones in my lugs! Oh yes, I need to put my clothes on too… mustn’t forget that! Yesterday I photographed the Falkirk Parkrun; the photographs can be seen on my Flickr account. I wish that the Parkrun fitted in more easily with the training schedule, but the trainer was quite emphatic that if you’re training your body to run a long distance slowly, there’s little point in asking it to run a comparatively short distance fast. As I completed the table below, I realised that this week I have crossed the 100 miles mark in training! Woot woot! Click this link to see how Runkeeper managed to deal with today’s threshold run! Of course, if I am given the chance to talk about myself I will always go into more detail, so here goes! Monday saw some New York City Ballet stretching and abs work, Tuesday saw me doing some threshold running. Ten minutes of warm-up, three by (six minutes at threshold, two minutes jog) followed by ten minutes of cool down. The left me feeling tired but not exhausted, and 5.7 miles under my belt. On Wednesday, my new toy arrived – a Garmin Forerunner 405CX. But I was getting onto a train on Wednesday just after work, and travelling south to Stevenage. So I didn’t get a chance to use it until Thursday, when I made a total pig’s ear of using it! I was supposed to be meeting a colleague to go for dinner after work, and wasn’t sure about how the time was going. And since I hadn’t correctly programmed the Garmin I had no idea of distance either… so I ended up doing a really short run of 2.9 miles. By ;Saturday, I had worked out how to program the beast, but when I went out to do a hill session I reckon I just hadn’t had quite enough “awake” time. It was good for family life that I finished my run early in the day, but made for a pretty lousy run! Still, it had a pretty solid 184foot climb in it, so it can’t be all bad. Finally, on Sunday the second Long, Slow Run. My utterly stupidly optimistic marathon pace is 9 min/mile. That means I should have had a 10:00 to 10:15 LSR pace. I couldn’t do it. Every step at that pace was heavy and uncomfortable. So I quickly gave up and did the bulk of the 11 miles at 9:30-ish pace. At least, that was the pace until I came off the canal and climbed Wallacestone Brae… the pace dropped to 13:30 in that phase! Next week sees two landmarks – I should pass 100 miles in training, and should be taking part in the Devilla Forest 15km race on the Sunday… let’s see how it goes! I am now a very confused ham. I saw this link to a video on YouTube… very funny! One thing I have discovered about running as a hobby is that…. well… it’s not always about the running. Take today, for example. Don’t walk on the ice! My plan was to run along the Union Canal. This is a great place to run as it is comparatively soft underfoot (it’s not concrete), and it’s flat. The Union Canal is a so-called “contour canal”, which means that it stays the same height above sea level from start to finish. I joined the canal where it meets Nicolton Road. 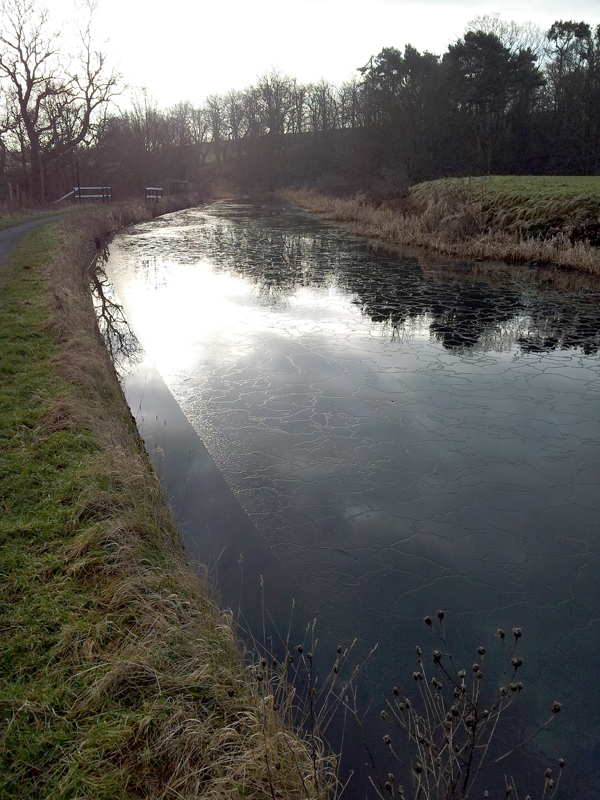 The first thing I noticed was that the canal was partially iced over, and the way the thin ice had frozen resulted in a really interesting pattern of cracks. 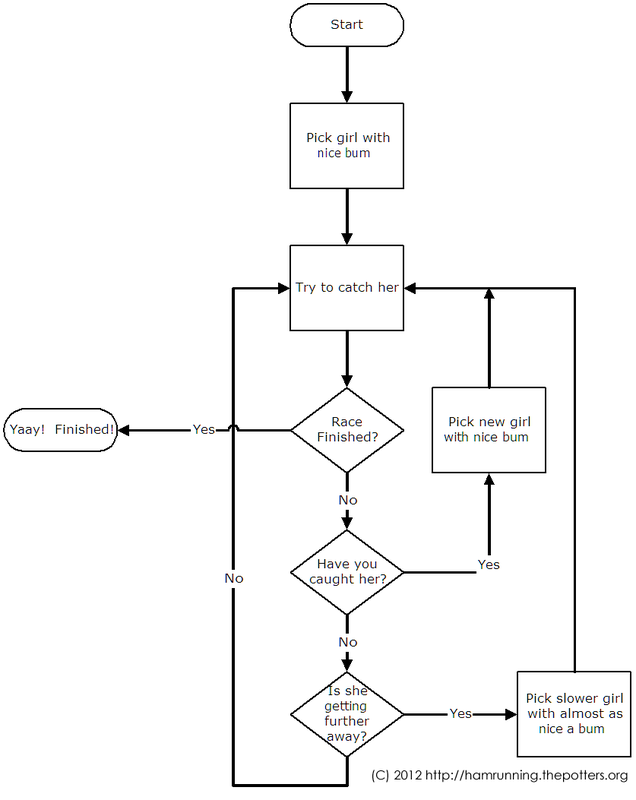 But now for the dilemma. I’m running, right? That means I should be concentrating on times, on splits, on keeping the effort level up and the heart rate in a certain zone, no? Well, for some training, sure. For the marathon itself, undoubtedly. But for a long, slow run where you are seeing beauty you don’t normally take the chance to see? Sorry, no… So I stopped and took a picture. Then came the big challenge. The stop had obviously affected my average pace, so should I run a bit faster to catch up? Well, I was on a long, slow run. The idea is that you run quite slowly, a full minute per mile slower than your projected marathon pace, to get used to spending lots of time on your feet but without damaging your muscles. 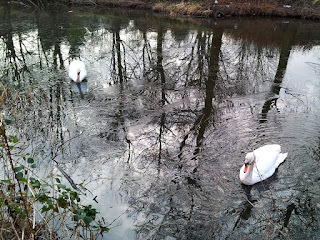 Two swans a-swimming – just! Let me say, running a minute per mile slower than you want to – slower than your natural pace – is really, really difficult. And of course I ran faster to try to get the average pace back to where it should be! The next thing I saw was these two swans. When I arrived, they were walking on this thin ice, and beating it with their feet. By the time I got the picture taken, they had broken through and were sitting in the water itself. They must have had cold behinds! Again I tried to catch up with the average time, but there was significantly more tree cover by this point and Runkeeper and my phone were having a very difficult time giving me an accurate position, and hence an accurate time. So I had little real idea how fast I actually was going. One quarter mile gave me a pace of eleven minutes thirty per mile, the next seven fifteen, with no feeling of a change of effort level on my part. The next point of interest is one that will be my Photo of the Day today. We had some pretty severe storms recently in Central Scotland, and the evidence is still widely visible in the form of fallen trees, or trees whose branches have been ripped off by the wind. 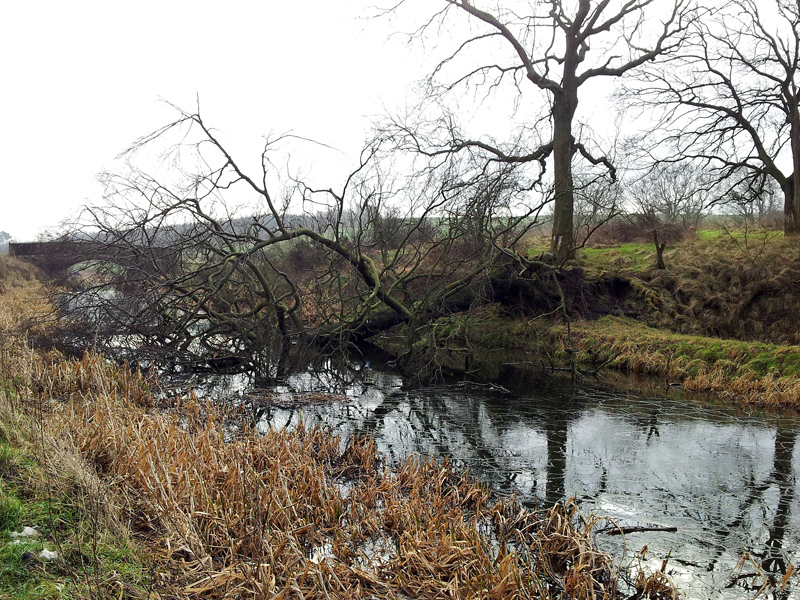 Well, it turns out that the canal didn’t escape either, and it is in fact blocked by a fallen tree. I don’t know how long the canal has been blocked, and how long it will remain this way. But it’s quite a sight to see! The canal enters a tunnel at the south-west of Falkirk, and that was the point at which I chose to turn round and head for home. My aim had been to run for seventy-five minutes, by the time I got home it had been closer to ninety! Next week I hope to run a similar route, but going a bit further east before joining the canal. I hope to stop and take pictures again! So, that was the first week of training, was it? I am thinking of renaming this blog “A Life In Lycra”! What with training on Tuesday, Thursday and Sunday, and yesterday’s marathon training seminar, I seem to be spending more time in running gear than in normal clothes. Tuesday saw a 4.8 mile “easy” run round Dalgety Bay. This route was partly road running and partly along the beautiful Fife Coastal Path. However, I think I may have let my foot fall badly at some point, because I had a few twinges for the next couple of days. My next run was Thursday. This time, I started off trying to keep my pace solidly in the aerobic heart rate zone. That was undoubtedly an interesting experience; in order to do that I had to keep myself to around an 11:30 minutes per mile pace. I lasted with that for the first half of the run, then gave up and went at a more normal pace for the second half. I later learned that the technique was all wrong, and that I should only be looking for a specific zone after about a fifteen minute warmup. Saturday saw the marathon training session I described yesterday, where my training plan was thrown into some amount of chaos. We did a threshold training session during the day, where we ran 4 x 5-minute threshold runs with 90s jogging in between. Sadly Runkeeper failed to record the session correctly, so I am going to be generous and give myself three miles for that effort and make up a calorie count. Sunday saw my first Long, Slow Run (LSR). Where my previous training plan told me that it should be 7 miles, this new plan has it as 75 minutes. Given that I am going for a target pace of approx 10:10 minutes/mile in my LSRs (which I hope I would be able to convert to 9:00/mile in the marathon), the distance-based and time-based versions come to approximately similar outcomes. But once again, Runkeeper crashed midway through the run and so the results are not as accurate as they could be. Runkeeper is becoming something of a problem, but I do have plans for that. I believe that my (very) early birthday present should be arriving during the week – a shiny new Garmin watch. That will be useful in as much as it gives me the chance to have an immediate indication of pace that I can see whenever I want. Runkeeper’s ability to report your pace every quarter mile is great, but the results are erratic. If it is true that for one quarter mile that my pace is “eleven minutes and thirty seconds per mile”, and the next my pace is “seven minutes and fifteen seconds per mile”, I would have thought that I would notice the difference in effort. But no, I think it was just some dodgy estimation by the app. Hey, it’s free, it seems mean to complain, but I am looking forward to using the Garmin! I had a fascinating marathon training day today in Edinburgh. The day was presented by Keith Anderson, who is a Commonwealth Games marathon runner. He covered a wide range of areas, from the theory of training through to some very practical issues relating to marathon day itself. He made sure that we knew that miles 18-23 of a marathon are hell, but gave techniques for working through that. He advocated the use of training that is specific to marathon running, and in particular he recommended threshold running as a way of persuading the body to restrict its lactic acid production to levels of exertion higher than those that you will find during marathon running. It was a lovely day; it was great to meet so many cheery people who were training for their first marathon, like me, or who had achieved their first marathon and were on their second or third. One thing that will affect this blog is that Keith was very keen on basing training – especially on the long, slow run on a Sunday – on time rather than distance. If, as he believes, a weekly increase of fifteen minutes or so is a safe level, how can that be converted to a change in distance without knowing the performance of the athlete in question? So, I am thinking that I shall not track my training against the training plan I have, but against a time-based training plan. That plan has me running 75 minutes tomorrow – I’ll let you know how I get on. I’ve found a couple of events that are useful for “piggybacking” onto in my training plan (specifically the Devilla Forest 15km and the Lasswade 10 mile) and so have updated my training plan. I am officially “in training” now, although with today being a rest day it does feel something of a cheat!